Jaguar Singapore, together with retail partner Wearnes Automotive, has brought vibrant colours and personality to the streets of Singapore in a local activation that showcased art by contemporary New Zealand artist, Evan Woodruffe. This artistic activation was part of Jaguar’s latest global brand campaign “A Breed Apart”, which recognises people who are uniquely different in their own field. The activation started with an exhibit of a selection of Woodruffe’s work at the Jaguar showroom from 8 to 13 November; live wrapping of Jaguar’s latest compact SUV, the E-PACE, in Woodruffe’s art on 9 November; and a Singapore driving tour using the artistically embellished vehicle on 12 November. By taking the wrapped E-PACE to the streets of Singapore, Jaguar was able to make art visible to everyday Singaporeans, as well as introduce Singapore as a destination to a community of local and international art enthusiasts. 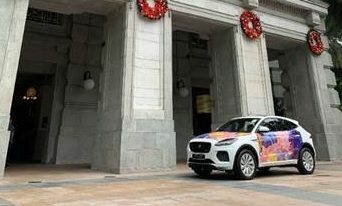 The Jaguar E-PACE stopped at iconic locations around Singapore’s city centre, including the MICA (Ministry of Information, Communications and the Arts) Building, Victoria Memorial Hall, Sri Mariamman Temple and The Fullerton Hotel. In addition to visiting local landmarks, Jaguar introduced Woodruffe to Singapore with a driving tour, conducted by Singapore social media maven Shermaine Khoo (@shermainxk). “Jaguar is a brand that exists to excite the senses, making the ordinary extraordinary. With this collaboration, we saw relevant synergies – to showcase the technical artistry present in both our cars and Evan’s art in the sphere of “The Art of Performance”. By using the creative art space, we aim to inspire and resonate towards younger audiences and fans of the brand,” Corinne Chua, GM, Jaguar Land Rover, Wearnes Automotive, said. Ralph Lauren and Speedo among four to end sponsorship. .. It will undertake public relations duties for a period of a year, with an option to renew for an additional one. ..
"Don't be too fixated on the latest trends but understand enough of what's happening.".. Marge Reid has been promoted from her designation as general manager and head of trading for OMD Melbourne. ..